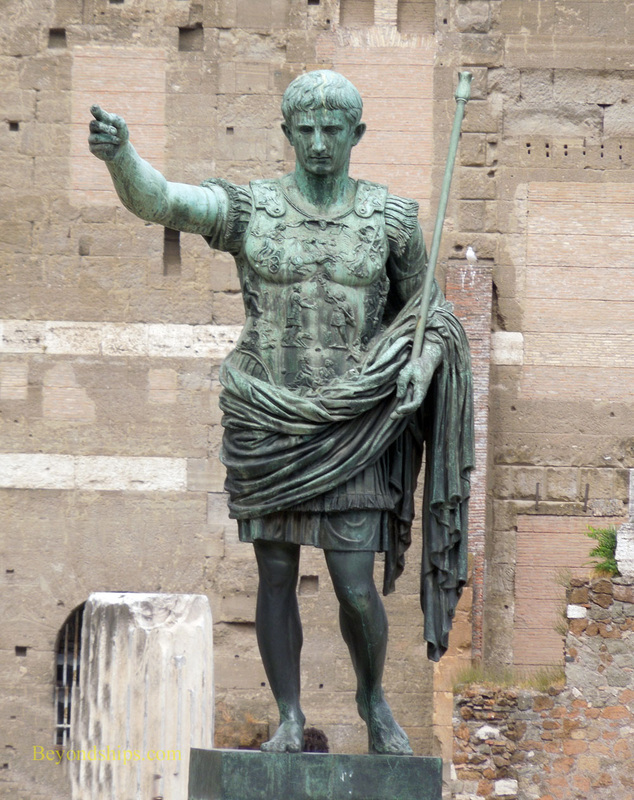 Above: Statue of the Emperor Augustus. At this point, I entered the ancient world. The busy Roman traffic was still there and 21st century tourists still abounded but the focus had shifted exclusively to landmarks from the days of the Caesars. 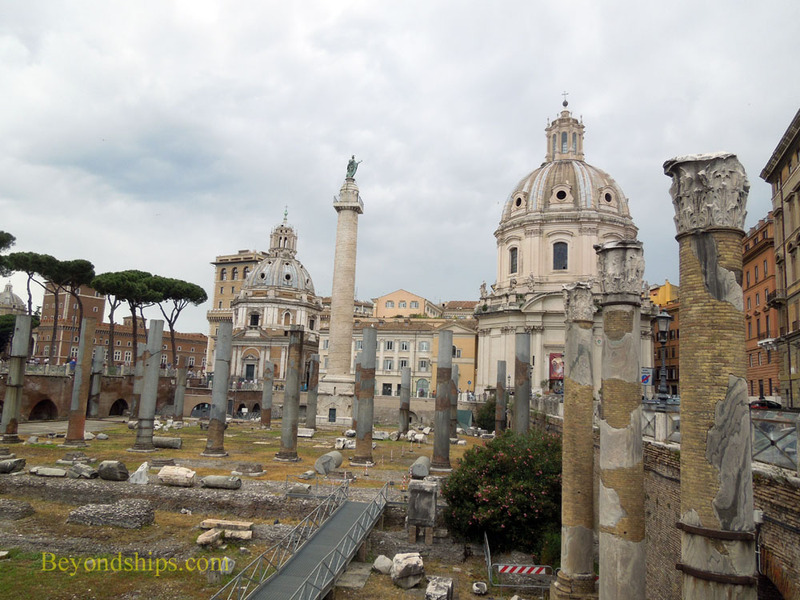 The first ancient monument I encounter was Trajan's Column in the midst of the Trajan Forum. Erected in 113 A.D. to honor the Emperor Trajan, the column is known for its sprial bas relief. The statue on top is not Trajan, however, but rather a statue of St. Peter put there in 1587. Proceeding a little further south, I came to the Trajan Market where ancient Romans shopped (above). It has been described as the world's oldest shopping mall. 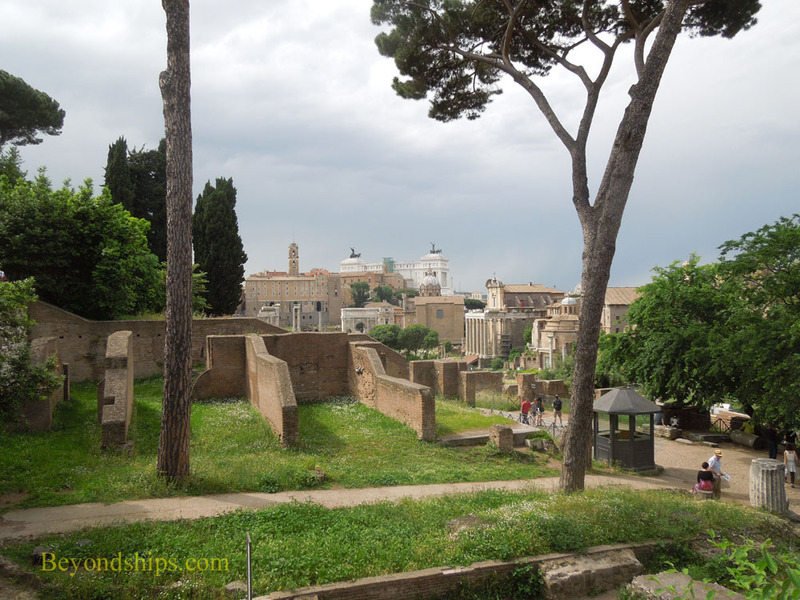 Crossing the busy street, Dei Fori Imperial, you come to the main part of the Forum. Actually, the area includes several fora including the Forum Julium and the Romano Forum. 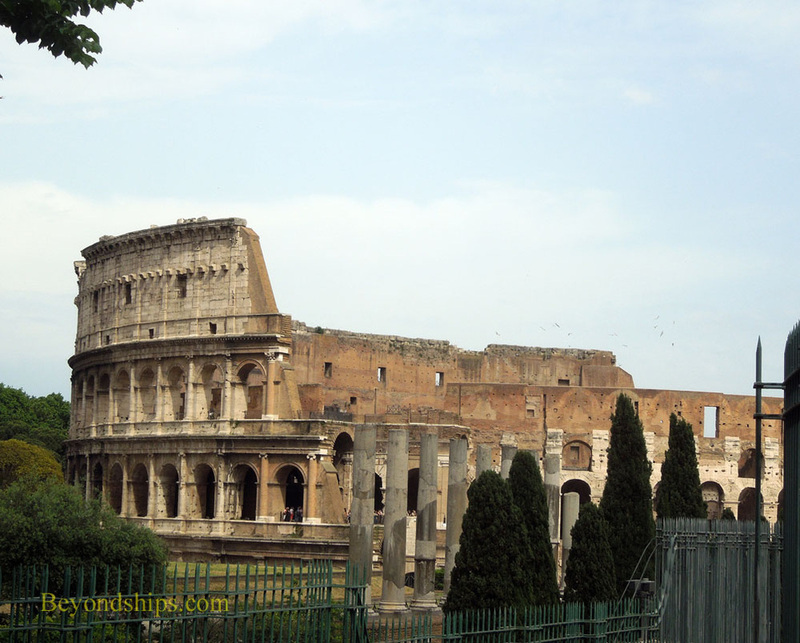 As you walk along towards the Colossesum, which is visible at the end of the street, you see the ruins of palaces, temples, government buildings and other ancient structures. The Colosseum was the largest amphitheater in the Roman world and is still considered a marvel of ancient engineering. It was begun in 70 A.D. and completed 10 years later. During Roman times, not only were there gladiatorial contests inside but there were battles between animals and even sea battles in the flooded arena. It could hold between 50,000 and 80,000 spectators. Admission was free. These days there are no games and admission is no longer free. 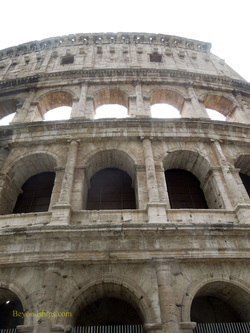 In addition, much of the decoration that once covered the exterior of the Colosseum has been looted over the centuries. 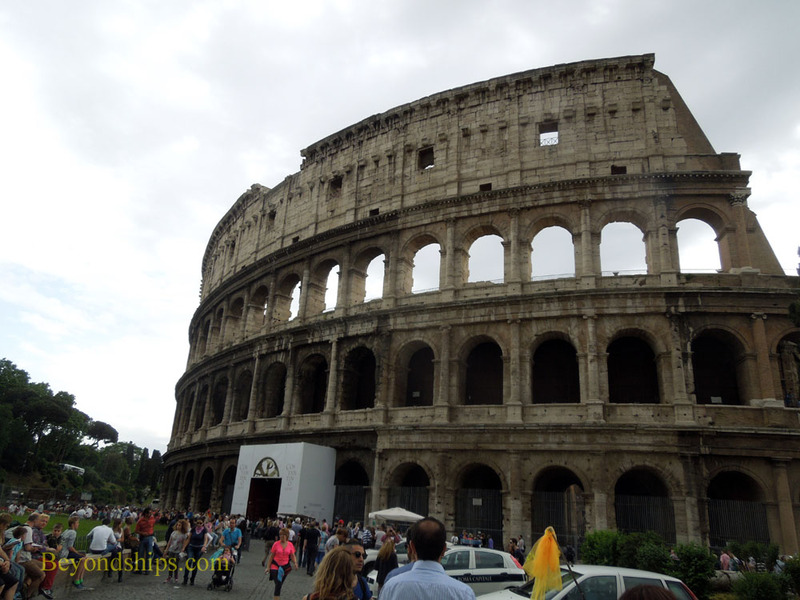 Nonetheless, the Colosseum remains a very popular venue with many visitors each day. 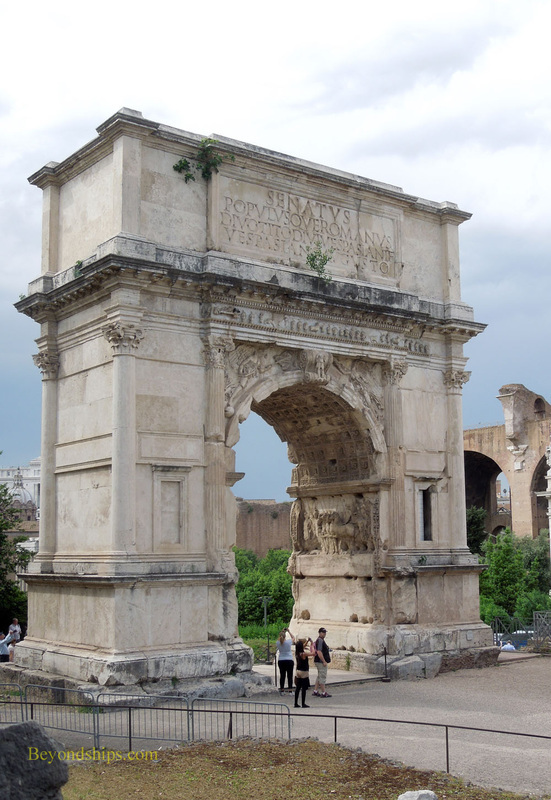 In the same area as the Colosseum is the Arch of Constantine, erected in honor of the Emperor Constantine's victory at the Battle of Milvian Bridge in 312. Unlike many ancient monuments, this arch still has much of its decoration. Off to the right of the Arch of Constantine is a road (Via Sacra) that leads to the main entrance into the Forum. There is an admission charge. 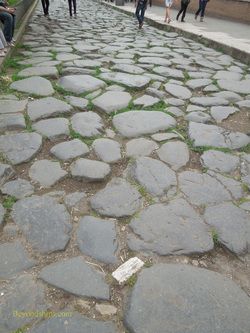 Leading off from this road is a sidewalk that will take you up the Palatine Hill. From there, you can get a panoramic view of the Forum and the City beyond. I have always found it to be not only a pretty view but one that is somehow peaceful and timeless. Perhaps that is one reason why they call Rome the "Eternal City." 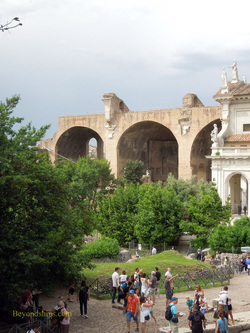 Left: The Arch of Titus from 81 A.D.
Below: A view of the Forum from the Palatine Hill.